The Combi is a flat surface rotowash cleaner with a pressure washer, allowing the user to wash flat surfaces such as pavements, walkways, cobbles and more using a high pressure cleaner and then quickly and easily converting to a pressure washer for cleaning buildings, park furniture and vehicles with the addition of a lance. What’s more the Combi is fast and efficient and is the ideal solution for cleaning companies, local authorities and FM companies! The Combi is revolutionary for high pressure cleaning of flat surfaces and is especially important to maintain high levels of cleanliness as well as keeping certain areas clean and safe from potential slip hazards. Denbigh Council now have multiple Combi’s on their fleet for carrying street cleaning as part of keeping public areas safe to avoid injury. Many Facilities Management companies also use the Combi for cleaning shop and supermarket car parks. Transporting the machine is relatively easy in comparison to other solutions, making it the first choice for high pressure cleaning. The Combi is a popular choice for cleaning areas around bus stops, after the flat surface cleaner has been used; a lance is added to clean bus shelters. Another huge benefit is the Combi will also work as a standalone pressure washer by attaching a lance, ensuring that the operator gets the best of both worlds. There is also options for a chewing gum removal lance and the EMIS – Environmental Media Injection System – which is designed to accurately dispense fine grade blast media such as Armex, to improve cleaning of difficult surfaces or where more aggressive cleaning is required which is an ideal solution for graffiti removal. 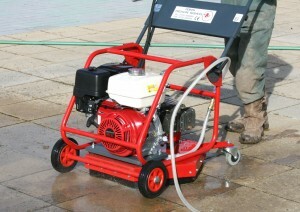 The Mini-Bowser and Combi can be partnered up with the EMIS as a graffiti removal package and chewing gum removal.